Diba Kushkaki, 40, is a mother of six from Kabul who has been living in the United States for more than 10 years. 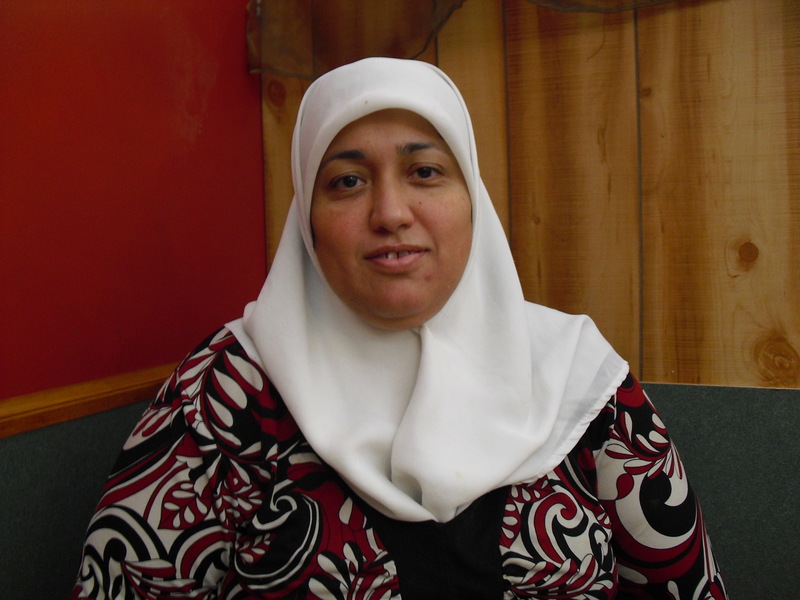 You might recognize her better as the owner of the the Afghan restaurant on University Boulevard, Sultan’s Palace. The soft-spoken mother of 6 sat down with me this morning under one of the beaded silk canopies at the Palace. Diba left Afghanistan when she was just 10 years old, at the time of the Soviet Invasion of Afghanistan. She lived in Pakistan for 6 years before moving to Germany where she lived for another 14 years. It was her father-in-law who sponsored her family’s move to America. Her uncle was living in Tucson at the time and running his own construction company. “My passion was cooking,” Diba told me. “When I used to live in Germany, I always wanted to have a small… take-out place or something like that. But never got the opportunity.” She finally got that opportunity when a friend told her to check out a location on Drachman. She opened Sultan’s Palace in 2005 with 2 other friends, both Afghan. But the restaurant never made enough of a profit for the 3 of them to share, so they left the business to Diba in 2006. In 2007, they began the move to their current location, which finally opened in 2008. The expenses in the smaller location are more than what they paid at the bigger restaurant. “My mom actually is a very good cook, very good cook. But I never learned from her,” Diba said. In fact, it was her husband that taught her how to cook! Once she learned the techniques of cooking from her husband, Diba began experimenting with flavors and measurements. 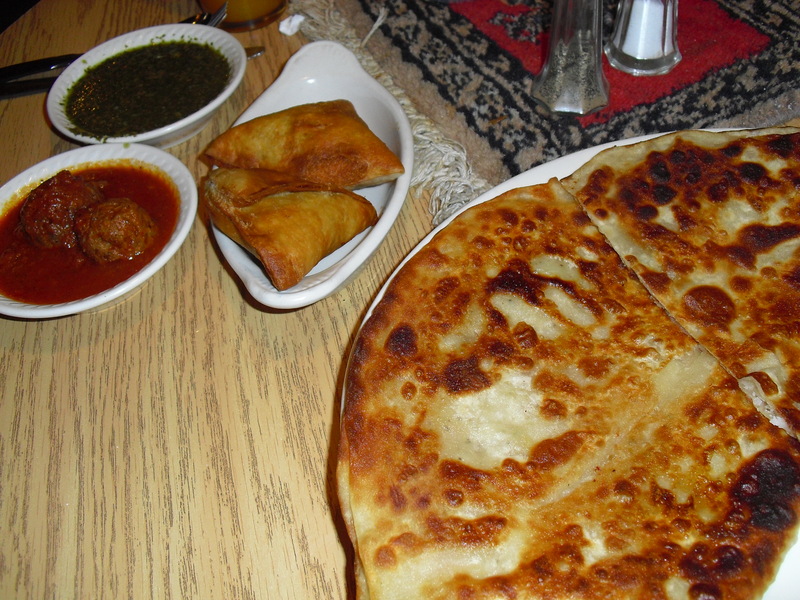 “Everything is Afghan,” Diba says about her recipes. She keeps the dishes served at Sultan’s Palace as authentic as possible. All the meat is halal and all the spices are brought in from Los Angeles. “There’s a lot of food that we kept out.” The decision to leave certain recipes off the menu was made based on how feasible it was to freeze the food or how long it would keep in the refrigerator. Her customers more familiar with Afghan cuisine have called her up specifically for such dishes, however. With the Department of Near Eastern Studies just around the corner from their restaurant and the Islamic Center of Tucson just up the street, Sultan’s Palace gets a lot of business from the greater Muslim community in Tucson. Especially during the month of Ramadan, Sultan’s Palace was a local favorite of many to break their fast. Tonight I decided to break my fast at the Afghan restaurant on University Blvd, Sultan’s Palace. In keeping with the title of this blog, I decided it was only fitting to order… wait for it… BOLAANEE! To start off, I ordered a dough (pronounced doe-gh… the “gh” makes a “ghayn” sound if you’re familiar with Arabic or Persian… if not, basically, you’ll need a lot of phlegm). 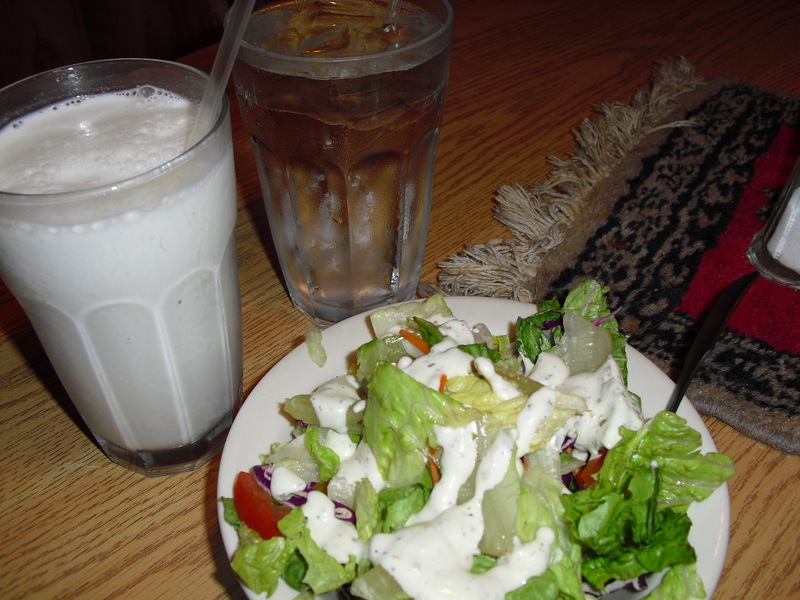 Dough is a yogurt-based drink. You can get it with or without mint (I like mint). For me, it reminds me of summertime just as much as a juicy watermelon. My mom would make a pitcher of this to drink along with dinner or lunch. My good friend, Toni, joined me for dinner tonight and she ordered vegetable sambosas with chutney and kofta. The vegetable sambosas are filled with spiced potatoes and peas, the chutney is a spicy green dipping sauce, and kofta are Afghan meatballs simmered in a tomato-based sauce. 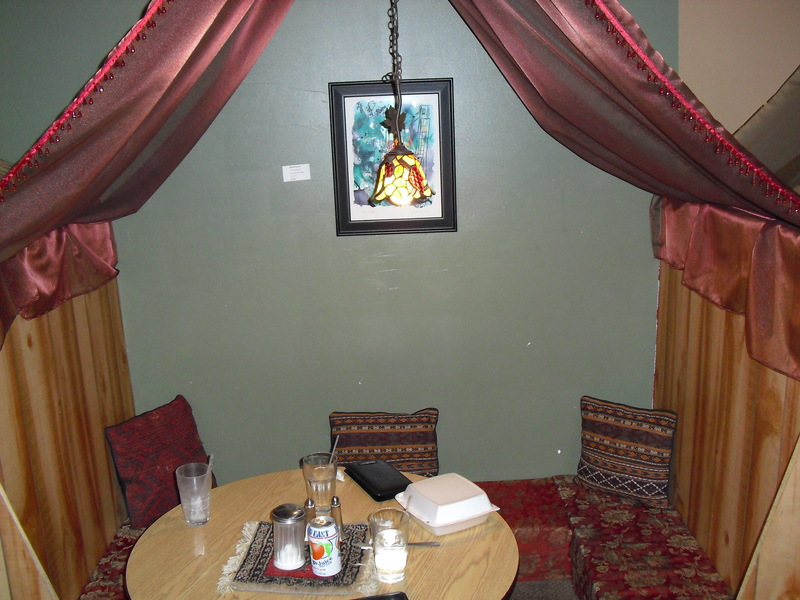 Sultan’s Palace is more than just an ethnic restaurant with good food, the ambiance there is quite cute as well. All along the sides of the restaurant, the owners have designed private little nooks that couples or groups can sit together and enjoy their meals. Guests sit on comfy little pillows on the floor under a silk canopy. When I first moved to Tucson, as soon as everyone found out I was Afghan, they immediately asked me if I’d eaten at the Afghan restaurant yet. By the end of my first week here, I’d had half a dozen invitations from people to eat there with them. The restaurant was still located at their old location on Drachman back then. A group of about 15 of us ended up going there together and ate some absolutely delicious food! But that was the last weekend they were open at that location. The owners were planning on moving the restaurant to a location just off of University Blvd in the alley between Chipotle and Which Wich. The location has been open now for about 2 years and I’ve had lunches with old friends, first dates, birthday and iftar dinners, picked up food for a party they were catering, and arranged fundraisers there. In all this time, I’ve come to know the family that owns that restaurant pretty well. They’re a nice family that immigrated from Afghanistan. I don’t know how long ago, or under what circumstances. That’s what I hope this project will be about. Not so much the restaurant, but the story of the people that own it. Every immigrant has a story, simultaneously unique and universal. And in this time when Arizona and America are putting immigrants and refugees under close scrutiny, it’s important to take a look at those immigrants that are living here, raising their families, going to work, contributing to society. This project is one of several that will be coming out of a multimedia class at the School of Journalism at the University of Arizona. Many of us are looking at various immigrant communities in Tucson and I’m hoping that these projects can weave together and put the human element back into the debate on immigration rights, as it is an issue close to my heart.